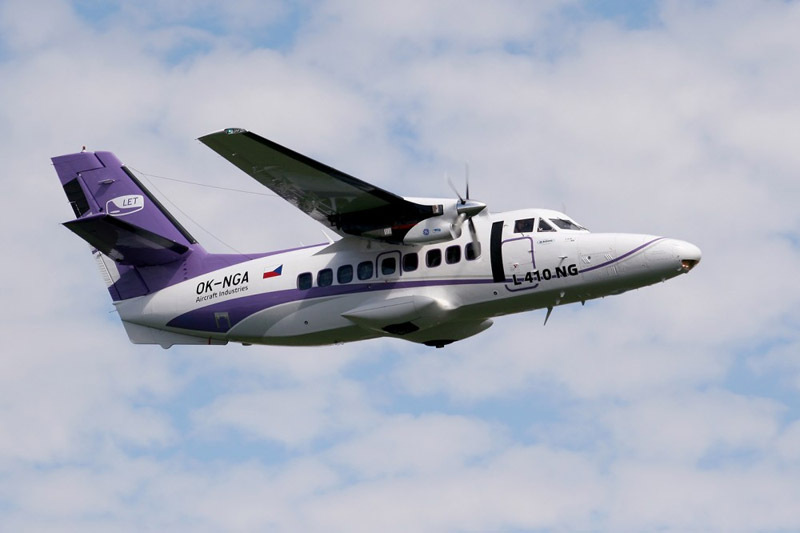 Following the ROLL OUT ceremony of prototype L 410 NG, which took place on 15th July 2015 in Kunovice, the Czech Republic, the Aircraft Industries Company successfully completed the maiden flight of this prototype on Wednesday the 29th July at the company airport. This flight initiated series of certification flight tests in accordance with corresponding regulations. During the first flight were tested basic flight characteristics and performance of the aircraft, control system functions, power plant functions, fuel system functions, navigation system functions etc. The crew included pilots Petr Jarocky and Stanislav Sklenar together with the company specialists from the production quality department. The L 410 NG aircraft is substantially upgraded model of the current serially produced L 410 UVP-E20 turboprop commuter. Thanks to the new wing structure, with integral fuel tank and increased fuel capacity, the L 410 NG enables significantly longer maximum range (2500 km) and endurance (10 hours). The all-metal, high-wing twin turboprop can transport 19 passengers and thanks to its increased maximum payload (2154 kg/4749 lb) and larger front luggage compartment increasing the total luggage compartments volume to 2,98 m3/105,24 cu.ft, the aircraft can carry up to 400 kg more luggage/cargo. The L 410 NG aircraft is powered by new more powerful GE H85 engines with maximum take-off power 850 HP and AV-725 propellers. The new engine gearbox enables significant external and internal noise reduction due to lower maximum propeller speed reduced from 2080 to 1950 RPM. Thanks to engine power increase maximal cruise speed will rise to 417 km/hr TAS. The state of art Glass Cockpit Technology with the latest avionics from Garmin (G3000) provides the highest level of flight safety and comfort for the crew. L 410 NG with the most spacious fuselage in its category (passenger cabin volume 17,9m3/632 cu.ft) will also offer completely modernized passenger cabin interior and passenger seats with the highest standard of comfort and providing, similarly as the L 410 UVP-E20 model, maximum versatility and opportunity to use the aircraft in number of versions for a number of various types of operation. Service life of the aircraft will be also significantly increased (30 000 FH and/or cycles as minimum). The start of the L 410 NG serial production is planned in 2017 after the aircraft certification will be completed. The future goal of the L 410 NG manufacturer, the Aircraft Industries Company, is to produce up to thirty L 410 NG aircraft per year.